for a sure-fire crowd pleaser. Serve these hot appetizers with Louisiana Pork Riblets and use the same Blue Cheese Dipping Sauce. 1. Preheat oven to 450°F. Beat egg in a medium bowl. Add vinegar, oil, salt, pepper, garlic powder, celery salt and cayenne; stir until well combined. 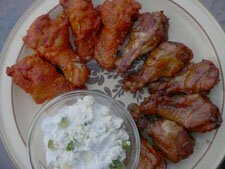 Dip chicken wing pieces into marinade and arrange on a large baking pan. Bake 30 minutes, turning and brushing with marinade several times, until chicken is crisp.